When you are out in the middle of a snowstorm, you will notice that the animals come out like you’ve never seen them before. 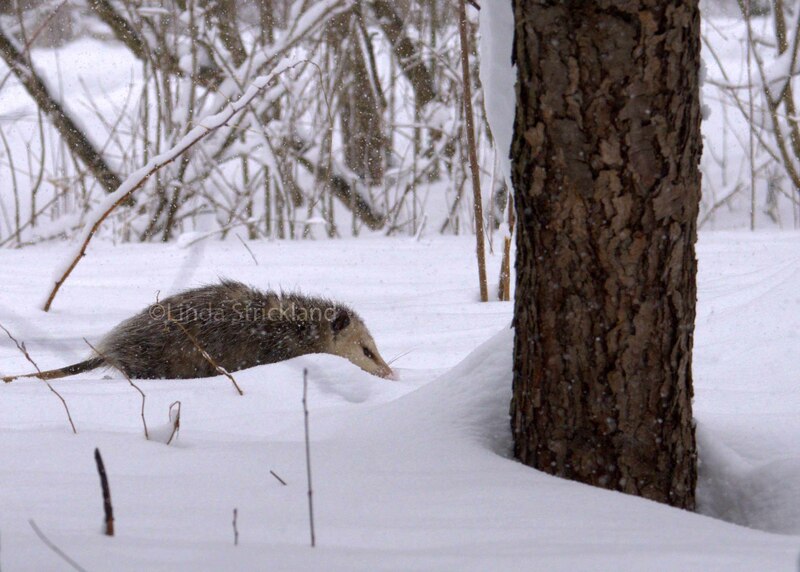 They are feeding, walking across the snow, finding shelter. There is truly a “flurry” of activity, literally and figuratively! I love to be out in the snow. When it’s coming down fast and furious and starts to build up inches quickly, driving isn’t always easy, but you can see things you never would otherwise, so it’s worth trying. I go to my favorite nature center which has a building, so I can go in if I need to. Around the building, there are 2 feeders, and this is the center of activity! I found the above possum walking slowly and surely towards a tree with a hole at the base. He went in! That must be his home. And the cardinals, which are usually very timid, were all around me. I can’t think of a better definition of heaven, can you? The animals are so intent on survival that they don’t notice you as much. Once you find a suitable place to be, you blend into their environment and you can stay there as long as your camera will be protected! 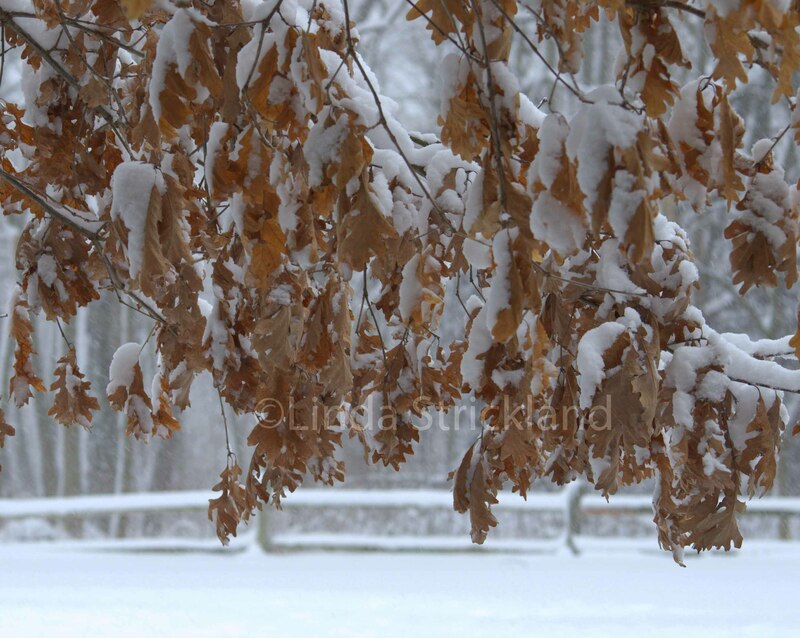 A thick grouping of trees often gives you enough shelter so that driving snow does not get to you so quickly. Also, being under the eaves of a building, where you see there is no snow on the ground, is another sheltered area. But you still have to notice which direction the snow is blowing, and position yourself accordingly. There are ways to protect your camera. I once observed a photographer bring an umbrella out of his bag, and hook it to his tripod! Another way is to travel with a plastic bag around your camera while it is already mounted on the tripod. Once you find your spot, and you are able to stay there long enough, you will blend into the environment, and get the most fantastic pictures. 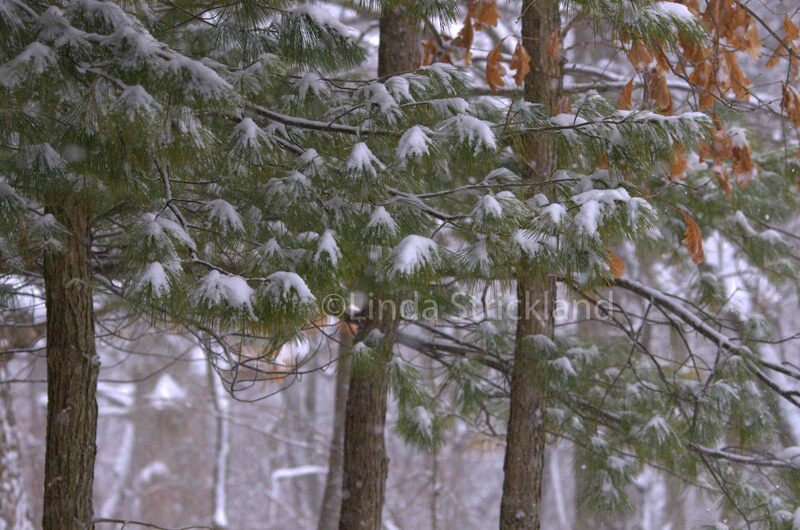 You will notice the snow start to coat the tree trunks, the leaves, and the animals themselves. And as little hills are created in the snow, you will see the birds climb onto them. The squirrels still have enough traction to scurry on the wet tree branches, and as they do their trapeze act, they clear the branch of its accumulating snow. There is no better place to be! Thanks Maryse. And I love that you can hear the silence! Beautiful thoughts from you. 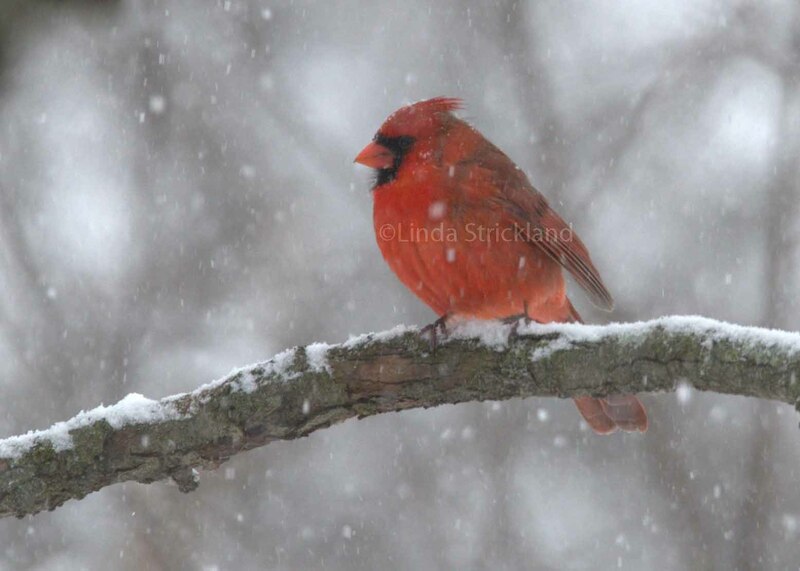 Love the pic of the red bird. And the silence you describe. Thank you Annie! I love being out in snow, although most would think that’s crazy. oh, no, I totally agree, I love snow as well and I miss it. here in Ireland there isn’t much!! You are so true about the flurry of activity and the way it feels like Heaven when creatures trust you and appear to surround you! Lovely, Linda! Thank you Robin! And this was 2 winters ago. After the winter of 2014, I can honestly say that it’s ok if I have to wait a long time to see snow again! hehe.